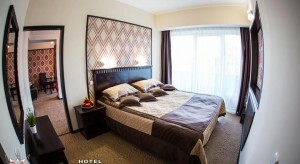 Decorated in modern style, rooms at Almaty Hotel are equipped with a minibar, flat-screen TV and fridge. Guests can enjoy European, Italian and Japanese cuisine in Assorti and Issyk restaurants, or relax with a cocktail at the bar. Kazakh State Academic Theatre of Opera and Ballet is only 100 yards from Almaty Hotel. Ascension Cathedral is 0.9 miles away. Almaty Train Station is a 10-minute drive from Almaty Hotel. A shuttle to Almaty Airport (10.6 miles) is available on request.